The Holisso Research Center is a state-of-the-art research library dedicated to studying the past and preserving information for generations to come. 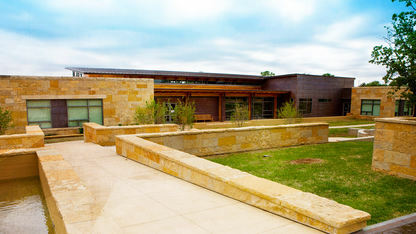 As an elemental part of the Chickasaw Cultural Center in Sulphur, Oklahoma, the center specializes in the study and research of the Chickasaw Nation and other Southeastern tribes. The Holisso Research Center also offers genealogy and photography archives, housing historical artifacts, objects, stories and valuable information handed down from Chickasaw ancestors of the past. These objects are protected with state-of-the-art technology, keeping these priceless items intact for many years to follow. The center dedicates itself to preserving the past for future generations to study and enjoy. The center is open from 10 AM to 5 PM Monday through Saturday and noon to 5 PM on Sundays. The Holisso Research Center welcomes all visitors to come and enjoy the wonder that is Chickasaw.